One Point Zero > Will New Zealand Manage its Rare and Precious Credit? Auckland, The Good, the Bad, and Maybe no Ugly! One day in Auckland was more than enough for me…..Its a good city, but its the centre of consumption in New Zealand! Every time I go there I’m astounded at the rate at which it is becoming a ‘bigger and better’ city, emulating the path of the great cities of the world, but also struggling to keep a bit of unique laid back ‘Kiwi-ness’. I can see the steep trajectory to the ‘That Success’, and with the average property price just have passed the $1 million dollar mark, and in a recent survey Auckland was ranked as the hottest property market in the world! Read here. Early on the morning of my bus departure for Wellington, I went my first real run in three weeks. I hate treadmills and gyms, and after three weeks of forced gym on ANL Bindaree, it was so good to get out and take in the Auckland Waterfront. There were lots of runners out, and in my ‘lucky to be out’, free frame of mind, I ‘smiled a Hi’ greeting each one as they ran past, but not one of the thirty odd ‘fellow’ runners acknowledged my greeting, just passing by as if I didn’t exist. Often making eye contact, but seemingly totally focused on some inner world priority. Almost home on the way back I came to the Hyatt Regency and there were two bellman on the pavement outside. With no guests to attend to they were enjoying sharing an early morning joke. I stopped running and said: “Hi guys, Congratulations! you are the first people I have seen smiling around here! Can I ask you guys a question? : I’m visiting from Nelson, and have been running for an hour and met a lot of runners along the way, greeted them, but not one greeted me back? In Nelson very single one would have smiled and greeted me back… What’s up here in Auckland today?” The point was made, and they just said: “You are lucky you live in Nelson, mate!” Is this the cost of ‘Success’ or maybe the insular reward of ‘Success’. Hmmm, what is Real Success, hey? Years ago, I used to have no doubt? I ran on thinking that here I am having just arrived in one of the very, very few ‘sub One Point Zero’, developed countries in the world, and three weeks ago I was in supposedly the most successful country in the world yet long time ago having turned its back on One Point Zero. I wasn’t so sure what Real Success is anymore…? Here I was in Auckland and I sensed it is in the cities of the world, where the answer to what ‘the Nation’ believes is Success, will be found? In the USA is was clear: The nation is a way over One Point Zero: The USA is a Two Point Three country: Over consuming, over populated, and a significant net Taker of Nature, so seeing the view from inside cities just confirmed ‘The Problem’. Here I’m in a country that is a Zero Point Six nation, below One Point Zero, still working inside Nature’s restraint. So looking inside the workings of Auckland it’s not obvious whether Auckland trajectory to Success is good for the nation’s continuing sub One Point Zero goals or not? From an economic success perspective, and positioning the country as a ‘competitive’ nation, and player on the global stage, Auckland’s increasing ‘Success’ is beyond question. 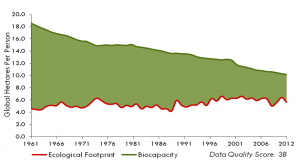 The custodians of the nation’s vision, whoever they maybe, maybe should be concerned about the rapid convergence of the nation’s growing average footprint and the ever declining ecological capacity (per person). This looks like a country who has the early stages of the same sickness that is now pervasive in developed countries, and I could help concluding that it’s the Auckland ‘Success’ and its broader impact on society values that is at the centre of this early stage fever? Herein lays a wonderful opportunity for New Zealand to adopt a One Point Zero vision and take a leadership position in the world. 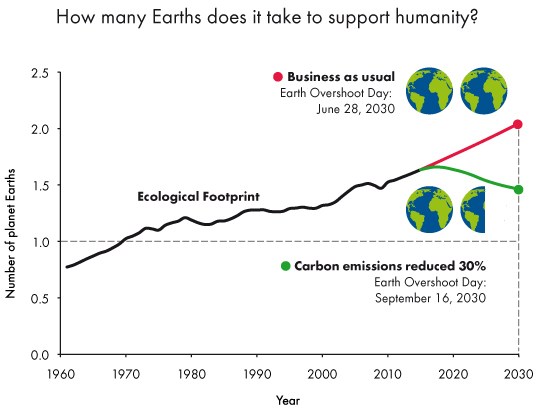 Being already very sustainability focused this would appear to be natural progression to a focused, quantifiable, and morally defensible sustainability goal. One that would force the powers that be to address the economic and ecological sustainability conflicts within an overarching goal. Dealing with these often competing issues, and the need for new or modified systemic solutions could provide many benefits to New Zealand while providing the world with inspiration and new ideas. 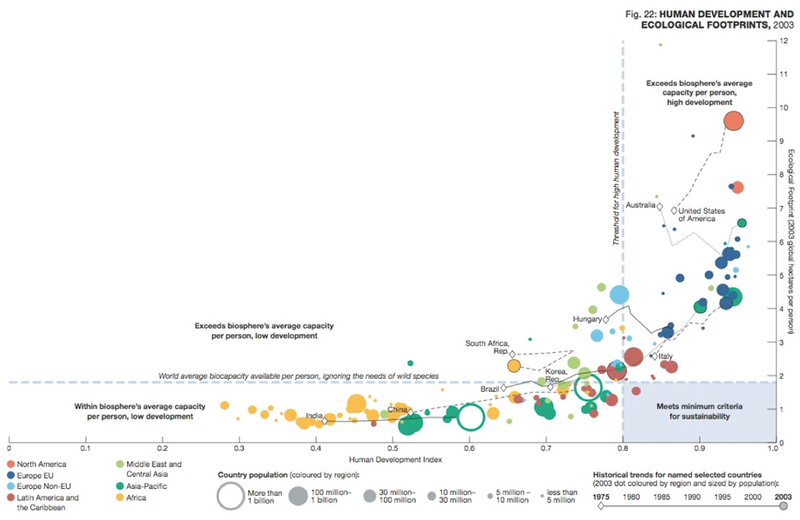 It would be a huge opportunity forgone, if the One Point Zero context is ignored and New Zealand merely by lack of awareness and focus moves beyond convergence on the graph above, and joins the other developed countries in debilitating and Chasm creating Ecological Footprint Debt. Maybe like Switzerland, New Zealand should have a referendum vote on whether to adopt a One Point Zero vision or not? Being in credit today makes it such a different vote to the Switzerland one… But one wonders whether the Auckland crowd will turn in a ‘Yes’ vote? I have no doubt that the South Islanders would be all behind a ‘Yes’! Like the Wealth Gap, I sense the One Point Zero Gap between the big consumers and the small ones, would show its range of faces! Is our fractured relationship with Nature accepted, and The Chasm destined to continue widening? Go All Blacks Go….This ‘Cup’ could be yours forever, The World needs you to vote ‘Yes’ and show the way back to Nature !! !